The Beatles outside "the Temple" at John Lennon's estate. Reporter: Where do you get your strength? John Lennon: From Hare Krsna. Yoko: That's where we get it from, you know. We're not denying it. 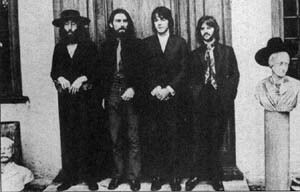 In September 1969. A. C. Bhaktivedanta Swami Prabhupada, founder-acarya (spiritual master) of the Hare Krsna movement, arrived as a house guest at Tittenhurst Park, the beautiful eighty-acre British estate owned by John Lennon. Three or four times a week, the Swami, who later became known to the world as Srila Prabhupada, gave public lectures in a tall, stately building at the northern end of the property a hundred yards from the main house, in which John and Yoko lived. The building had been formerly used as a hall for chamber-music recitals, but now several of Srila Prabhupada's disciples, who resided along with him in a block of guest houses on the property, installed a small Deity altar and a podium for Srila Prabhupada. The building never really had a name, but after Srila Prabhupada's arrival, everyone called it "the Temple." They still call it "the Temple" today, and except for the recent addition of an enormous crimson-and-gold pipe organ nearly covering the towering west wall, it exists unchanged, now surrounded by a recording-studio complex owned by Ringo Starr. On September 14, John, Yoko, and George Harrison, after enjoying an Indian vegetarian meal prepared by the devotees at the Temple, walked over to Srila Prabhupada's quarters for their first meeting. Yoko Ono: If Hare Krsna is such a strong, powerful mantra, is there any reason to chant anything else? For instance, you talked about songs and different mantras. Is there any point in the chanting of another song or mantra? Srila Prabhupada: There are other mantras, but the Hare Krsna mantra is especially recommended for this age. But other Vedic mantras are also chanted. As I told you, the sages would sit with musical instruments, like the tamboura, and chant them. For instance, Narada Muni is always chanting mantras and playing his stringed instrument, the vina. So chanting out loud, with musical instruments, is not a new thing. It's been done since time immemorial. But the chanting of the Hare Krsna mantra is especially recommended for this age. This is stated in many Vedic literatures, such as the Brahmanda Purana, the Kali-santarana Upanisad, the Agni Purana. and so forth. And apart from the statements of the Vedic literature, Lord Krsna Himself, in the form of Lord Caitanya, preached that everyone should chant the Hare Krsna mantra. And many people followed Him. When a scientist discovers something, it becomes public property. People may take advantage of it. Similarly, if a mantra has potency, all people should be able to take advantage of it. Why should it remain secret? If a mantra is valuable, it is valuable for everybody. Why should it be for only a particular person? John Lennon: If all mantras are just the name of God, then whether it's a secret mantra or an open mantra it's all the name of God. So it doesn't really make much difference, does it, which one you sing? Srila Prabhupada: It does make a difference. For instance, in a drug shop they sell all types of medicines for curing different diseases. But still you have to get a doctor's prescription in order to get a particular type of medicine. Otherwise, the druggist won't supply you. You might go to the drug shop and say, "l'm diseased. Please give me any medicine you have." But the druggist will ask you, "Where is your prescription?" Similarly, in this age of Kali* the Hare Krsna mantra is prescribed in the sastras, or scriptures. And the great teacher Caitanya Mahaprabhu, whom we consider to be an incarnation of God, also prescribed it. Therefore, our principle is that everyone should follow the prescription of the great authorities. Mahajano yena gatah sa panthah. We should follow in the footsteps of the great authorities. That is our business. The Mahabharata states, "Dry arguments are inconclusive. A great personality whose opinion does not differ from others is not considered a great sage. Simply by studying the Vedas, which are variegated, one cannot come to the right path by which religious principles are understood. The solid truth of religious principles is hidden in the heart of an unadulterated, self-realized person. Consequently, as the sastras affirm, one should accept whatever progressive path the mahajanas advocate." [Mahabharata, Vana-parva, 313.117] This Vedic mantra says that if you simply try to argue and approach the Absolute Truth, it is very difficult. By argument and reason it is very difficult, because our arguments and reason are limited. And our senses are imperfect. There are many confusing varieties of scriptures, and every philosopher has a different opinion, and unless a philosopher defeats other philosophers, he cannot become recognized as a big philosopher. One theory replaces another, and therefore philosophical speculation will not help us arrive at the Absolute Truth. The Absolute Truth is very secret. So how can one achieve such a secret thing? You simply follow the great personalities who have already achieved success. So our Krsna consciousness philosophical method is to follow the great personalities, such as Lord Krsna, Lord Caitanya, and the great spiritual masters in disciplic succession. Take shelter of bona fide authorities and follow them-that is recommended in the Vedas. That will take you to the ultimate goal. Evam parampara-praptam: In this way, by disciplic succession, the knowledge is coming down. Sa kaleneha mahata yogo nastah parantapa: But in the course of time the succession was broken. Therefore, Krsna says, I am speaking it to you again. So a mantra should be received from the disciplic succession. The Vedic injunction is sampradaya-vihina ye mantras te nisphala matah. If your mantra does not come through the disciplic succession, it will not be effective. Mantras te nisphala. Nisphala means that it will not produce the desired result. So the mantra must be received through the proper channel, or it will not act. A mantra cannot be manufactured. It must come from the original Supreme Absolute, coming down through the channel of disciplic succession. It has to be received in that way, and only then will it act. According to our Krsna consciousness philosophy, the mantra is coming down through four channels of disciplic succession: one through Lord siva, one through the goddess Laksmi, one through Lord Brahma, and one through the four Kumaras. The same thing comes down through different channels. These are called the four sampradayas, or disciplic successions. So, one has to take his mantra from one of these four sampradayas; then only is that mantra active. If we receive the mantra in that way, it will be effective. And if one does not receive his mantra through one of these sampradaya channels, then it will not act; it will not give fruit. Yoko Ono: If the mantra itself has such power, does it matter where you receive it, where you take it? Srila Prabhupada: Yes, it does matter. For instance, milk is nutritious. That's a fact; everyone knows. But if milk is touched by the lips of a serpent, it is no longer nutritious. It becomes poisonous. Yoko Ono: Well, milk is material. Srila Prabhupada: Yes, it is material. But since you are trying to understand spiritual topics through your material senses, we have to give material examples. Yoko Ono: Well, no, I don't think you have to give me the material sense. I mean, the mantra is not material. It should be something spiritual; therefore, I don't think anybody should be able to spoil it. I wonder if anybody can actually spoil something that isn't material. Srila Prabhupada: But if you don't receive the mantra through the proper channel, it may not really be spiritual. John Lennon: How would you know, anyway? How are you able to tell? I mean, for any of your disciples or us or anybody else who goes to any spiritual master how are we to tell if he's for real or not? Srila Prabhupada: You shouldn't go to just any spiritual master. John Lennon: Yes, we should go to a true master. But how are we to tell one from the other? Srila Prabhupada: It is not that you can go to just any spiritual master. He must be a member of a recognized sampradaya, a particular line of disciplic succession. John Lennon: But what if one of these masters who's not in the line says exactly the same thing as one who is? What if he says his mantra is coming from the Vedas and he seems to speak with as much authority as you? He could probably be right. It's confusing like having too many fruits on a plate. Srila Prabhupada: If the mantra is actually coming through a bona fide disciplic succession, then it will have potency. John Lennon: But the Hare Krsna mantra is the best one? Yoko Ono: Well, if Hare Krsna is the best one, why should we bother to say anything else other than Hare Krsna? Srila Prabhupada: It's true, you don't have to bother with anything else. We say that the Hare Krsna mantra is sufficient for one's perfection, for liberation. George Harrison: Isn't it like flowers? Somebody may prefer roses, and somebody may like carnations better. Isn't it really a matter for the individual devotee to decide? One person may find that Hare Krsna is more beneficial to his spiritual progress, and yet another person may find that some other mantra may be more beneficial for himself. Isn't it just a matter of taste, like choosing a flower? They're all flowers, but some people may like one better than another. Srila Prabhupada: But still there is a distinction. A fragrant rose is considered better than a flower without any scent. Srila Prabhupada: Let's try to understand this flower example. Srila Prabhupada: You may be attracted by one flower, and I may be attracted by another flower. But among the flowers a distinction can be made. There are many flowers that have no fragrance and many that have fragrance. Yoko Ono: Is that flower that has fragrance better? Srila Prabhupada: Yes. Therefore, your attraction for a particular flower is not the solution to the question of which is actually better. In the same way, personal attraction is not the solution to choosing the best spiritual process. In Bhagavad-gita [4.11], Lord Krsna says, "All of them-as they surrender unto Me-I reward accordingly. Everyone follows My path in all respects, O son of Prtha." Krsna is the Supreme Absolute. If someone wants to enjoy a particular relationship with Him, Krsna presents Himself in that way. It's just like the flower example. You may want a yellow flower, and that flower may not have any fragrance. That flower is there; it's for you, that's all. But if someone wants a rose, Krsna gives him a rose. You both get the flower of your choice, but when you make a comparative study of which is better, the rose will be considered better. Yoko Ono: I see a pattern in what you've said. For instance, you said that Hare Krsna is the most superpowerful word. And if that is true, then why do we bother to utter any other words? I mean, is it necessary? And why do you encourage us, saying that we're songwriters and all, to write any other song than Hare Krsna? Srila Prabhupada: Chanting the Hare Krsna mantra is the recommended process for cleaning our hearts. So actually one who chants Hare Krsna regularly doesn't have to do anything else. He is already in the correct position. He doesn't have to read any books. Yoko Ono: Yes, I agree. So why do you say that it's all right to write songs, speak, and all that? It's a waste of time, isn't it? Srila Prabhupada: No, it's not a waste of time. For instance, Sri Caitanya Mahaprabhu would spend most of His time simply chanting. He was a sannyasi, a member of the renounced spiritual order of life. So, He was criticized by great sannyasis, who said, "You have become a sannyasi, and yet You do not read the Vedanta-sutra. You are simply chanting and dancing." In this way, they criticized His constant chanting of Hare Krsna. But when Caitanya Mahaprabhu met such stalwart scholars, He did not remain silent. He established the chanting of Hare Krsna by sound arguments based on the Vedic scriptures. Chanting Hare Krsna is sufficient for liberation; there is no doubt about it. But if someone wants to understand the Hare Krsna mantra through philosophy, through study, through Vedanta, then we do not lack information. We have many books. But it is not that the Hare Krsna mantra is somehow insufficient and therefore we are recommending books. The Hare Krsna mantra is sufficient. But when Caitanya Mahaprabhu was chanting, He sometimes had to meet opposing scholars, such as Prakasananda Sarasvati and Sarvabhauma BhaTTacarya. And then He was ready to argue with them on the basis of Vedanta. So, we should not be dumb. If someone comes to argue with Vedanta philosophy, then we must be prepared. When we are preaching, many different types of people will come with questions. We should be able to answer them. Otherwise, the Hare Krsna mantra is sufficient. It does not require any education, any reading, or anything else. Simply by chanting Hare Krsna, you get the highest perfection. That's a fact.